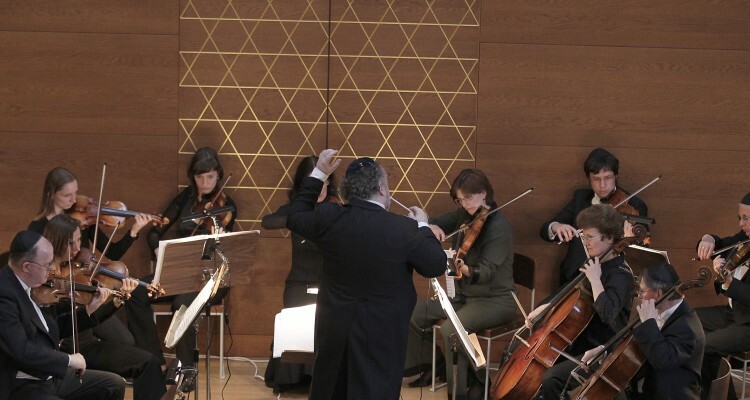 The New Jewish Chamber Philharmonic of Dresden, conductor Michael Hurshell, presented a programme of outlawed and neglected works by composers of Jewish heritage at the New Synagogue in Dresden on Sunday 29 May 2016, as part of the Dresden Music Festival. The programme included Michael Hurshell's arrangements of the third movement from Alexander von Zemlinsky's String Quartet No. 1 in A major Op. 4 and the third movement from Mieczysław Weinberg's Trio Op. 48, Leo Smit's Concerto for Viola and String Orchestra and Paul Hindemith's Trauermusik for Viola and String Orchestra both with viola player Itamar Ringel, and Erich Wolfgang Korngold's Symphonic Serenade for String Orchestra in B flat major Op. 39. 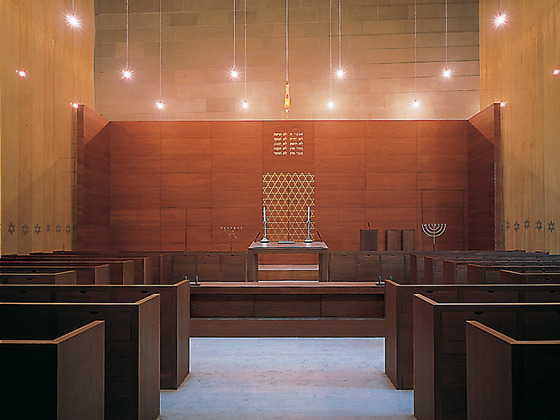 The concert took place in the New Synagogue in Dresden, which is the orchestra's main concert venue. This is a striking modern building dating from 2001 designed by Rena Wandel-Hoefer and Wolfgang Lorch. 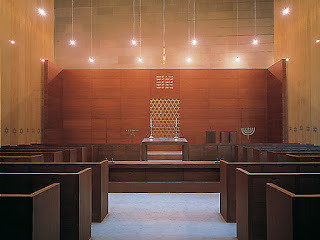 It is built on the site of the Semper Synagogue (1839–1840) designed by Gottfried Semper, which was destroyed during Kristallnacht in 1938. The orchestra (all strings, numbering 23 players) played on a temporary platform erected within the main body of the synagogue, whose interior is quite plain but full of stylish detailing, though a rather lively acoustic. The concert opened with Michael Hurshell's arrangement of the third movement of Zemlinsky's String Quartet No. 1 which was written in 1896. A late Romantic work with a certain conventionality to it, but with an interesting polyphonic quality to the music. An effective concert opener, it received a passionate performance from Hurshell and his orchestra. Leo Smit (1900-1943) was a Dutch composer who studied at Amsterdam Conservatoire and spent some time in Paris in the 1920s where he was in contact with members of Les Six. In 1943 Smit was deported to Sobibor extermination camp in Poland, where he was killed three days later. His Concerto for Viola and Orchestra dates from 1940. The opening movement was spikily neo-classical yet passionate, and Itamar Ringel brought a nice elegance to a solo line which engaged in dialogue rather than competition with the strings.There were some striking passages for the soloist just accompanied by a bass line, which moved neo-classicism almost to the neo-baroque. The lyrical second movement was powerfully intense, with a singing viola line. This movement in particular kept reminding me of Hindemith, though that composer's style seemed to hover in the background of the whole piece. The last movement was lively but with very angular melodic material and hints of anger intermixed with the lyricism. I was delighted to make the acquaintance of Smit's concerto, particularly in such a powerful performance. Mieczysław Weinberg's Trio, Op. 48, dates from 1950 by which time the Polish composer had been in the USSR for 11 years. His father-in-law was assassinated on Stalin's orders in 1948 and Weinberg eventually arrested, only to be saved by Stalin's death in 1943. Michael Hurshell's very effective arrangement of the third movement showcased the solo violin playing of the orchestra's leader, Dalia Richter. The melodic material had a Jewish or perhaps gypsy-ish folk style to it, the whole a lively dance. Paul Hindemith's Trauermusik was written at very short notice in 1936 in response to the death of King George V; Hindemith was in London preparing for the UK premiere of his viola concerto Der Schwanendreher and wrote the Trauermusik in tribute to the late King. An expressively elegiac work, Itamar Ringel's intense account of the solo line gave us lovely fine-grained tone and singing line. There was one beautiful moment when Ringel was in trio with the leaders of the first violins and the cellos, and the final section combined a choral played with magical hushed tone by the strings, and rhapsodic entries for the viola. The piece is quite short, but perfectly formed and this performance from Itamar Ringel, Michael Hurshell and the orchestra was rather moving. The final work in the programme was Erich Wolfgang Korngold's Symphonic Serenade which Korngold wrote in 1947-48, after he had stopped working on original film scores. The work was premiered in 1950 by Wilhelm Furtwangler and the Vienna Philharmonic Orchestra. But Korngold's attempt to resume his career as a writer of concert works, which had been interrupted by the Anschluss and the war, was a failure as the taste of the Viennese public had moved on. Indeed the music of the Symphonic Serenade does seem to belong to an earlier age, and listening to the performance I detected moments of Strauss and Mahler, as well as Wolf-Ferrari. The first movement was lyrical with quite a busy texture and a sense that the myriad motifs were in constant motion. Though melodic, it was nowhere near as sweet as a work like the Violin Concerto. The scherzo-ish second movement was all pizzicato with two short atmospheric trio moments played arco. The work seemed to almost outstay its welcome with a third repeat of the opening material, but Korngold tricks us and finishes it early. The third movement was slow and intense with a rich texture, reminding me of Richard Strauss (33 years Korngold's senior). The final movement was something of a perpetuum mobile, marked Allegro con fuoco it was certainly performed with fire, again alternating arco and pizzicato. I have to confess that, much as I enjoyed the work, I thought that each movement seemed to slightly out-stay its welcome and the whole could have been a bit more concise. The orchestra's main aim is to present works by Jewish composers, or composers of Jewish descent, who were persecuted, banned from performance, exiled or murdered in the camps by the Nazis. This programme introduced us to a wide range of works, either unknown or rarely performed in performances which were stylish and engaging.